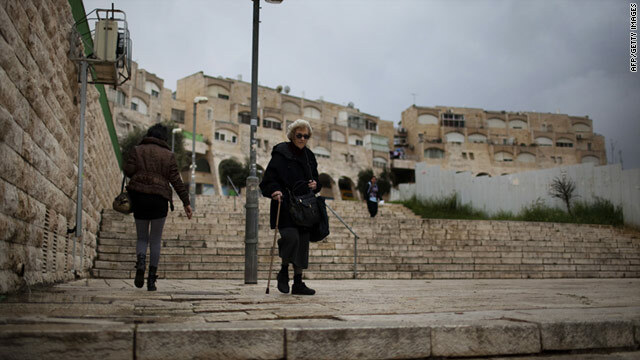 Israelis are seen in East Jerusalem's Jewish settlement neighbourhood of Gilo on Monday ahead of a housing vote. Jerusalem (CNN) -- A Jerusalem municipality planning committee approved a plan to build 942 housing units in Gilo, a disputed neighborhood in Jerusalem, just before Israeli President Shimon Peres was to meet with President Barack Obama in Washington. And as Tuesday's meeting between Obama and Peres got under way, a second Israeli committee OK'd another controversial project, a park near the eastern edge of Jerusalem. The Obama administration and Israeli Prime Minister Benjamin Netanyahu have been at constant odds over plans for construction in the West Bank and contested areas of Jerusalem. The project for Gilo, on the city's southern outskirts, was approved Monday but will now need to go before another panel if it is to proceed. While construction is years away, the Jerusalem committee's move damages potential peace efforts with Palestinians, said Yosef Aflalo, a council member for the left-wing Meretz Party. "Although there have been past agreements in negotiations that the Jewish neighborhoods of Jerusalem will stay in Israel and the Arab neighborhoods will be part of the Palestinian capital, as long as there is no peace agreement the Palestinians still see Gilo as occupied land and a settlement. This is perceived as a provocation," he said. Gilo sits in territory Israel annexed from Jordan after a war with its Arab neighbors in 1967. While Israel considers the area an integral part of its sovereign capital, Palestinians and the international community do not recognize the claim and oppose continued Israeli building absent a peace agreement. "The attempt to portray the construction in Gilo as a provocation is hallucinatory," the Jerusalem municipality said in a statement. "The Jerusalem municipality will continue to build for Arabs and Jews in all parts of the city. This construction is vital for the development of the city." The municipality said, "The plans being discussed are on private-owned land, and the owners wish to advance the construction according to the master plan and in accordance with the law." The move came the same day the Israeli defense ministry retroactively approved construction that had already begun in a number of West Bank settlements. The park approved by Israel's district planning committee on Tuesday would be in an area connected to another controversial tract of land referred to as "E1." It's a section of land between Jerusalem and Israel's largest settlement, Maale Adumim, in the West Bank. Israeli plans to build in the area have attracted condemnation as they would interfere with the contiguity of a future Palestinian state, separating the Arab neighborhoods in East Jerusalem from the West Bank. The United States has opposed construction in the E1 area. British Foreign Secretary William Hague, in a statement, condemned Israel's decisions. "This is not disputed territory," Hague said. "It is occupied Palestinian territory and ongoing settlement expansion is illegal under international law, an obstacle to peace and a threat to a two-state solution. We call on the Israeli authorities to reconsider this decision, which undermines the prospects for peace."